If you have a missing tooth, you might not feel like smiling. But more importantly, a missing tooth can cause the teeth around it to move. Shifting teeth create new crevices for dental plaque to hide in, which can lead to tooth decay and the need for a tooth filling or gum disease treatment in the future. In addition, a missing tooth doesn't just leave a hole in your smile, it may also affect how you speak and chew. Fortunately you don't have to live with an embarrassing gap between your teeth. Dental implants are a popular option for replacing a missing tooth. Rather than resting on the gum line like removable dentures or using adjacent teeth as anchors like a traditional dental bridge, dental implants are surgically placed into the jawbone where they act as an anchor for replacement teeth or dentures. A dental implant looks and feels like a natural tooth, allowing you to chew and speak just like you did before. At the Chris Mercier Dental Practice we are proud to use Straumann dental implants. Straumann provides a full range of dental implants from bone level for placement in areas of high cosmetic demand to their newest Roxolid implant which can be placed in narrow ridges of bone. Following examination and assessment, the dental implant procedure is usually a three-step process requiring initially a surgical procedure. During the first step of dental treatment, we will drill a hole into the jawbone and a titanium implant is screwed into place. This portion of your dental implant treatment might sound painful, but most patients are comfortable with just local anaesthesia. (If necessary, sedation dentistry can be used for anxious patients). At the end of the procedure, the gum is secured over the dental implant, which will remain covered long enough for it to undergo the process of osseointegration, when the implant actually fuses to the bone, which usually takes three to four months. The second step sees the dental implant uncovered and a healing cap added. The healing cap allows the gum to heal and shape around the implant. At step three an abutment is connected to the implantacts as an extension, this serves as the foundation for your new tooth. 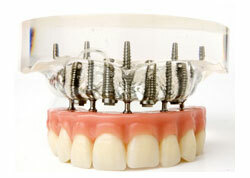 The dental crown, bridge or denture is then secured to the implant via the abutment. Since the crown, bridge or denture is fixed to the implant, your new teeth are extremely secure and will function, look and feel just like your natural teeth. Contact us on 0151 709 7948 today to find out how to get dental implants in Liverpool. See examples of dental implants in the Smile Gallery.